> Master’s degree in Economics/Business Administration/Business Studies/Management/ACCA or related field from recognized University with minimum 3 years’ experience in merchant banking/capital market companies and/or banking. Age not exceeding 40 years as on deadline of application. > Bachelor’s degree in Economics/Business Administration/Business Studies/Management or related field from recognized University with minimum 2 years’ experience in merchant banking/capital market companies and/or banking. Age not exceeding 35 years as on deadline of application. 1. 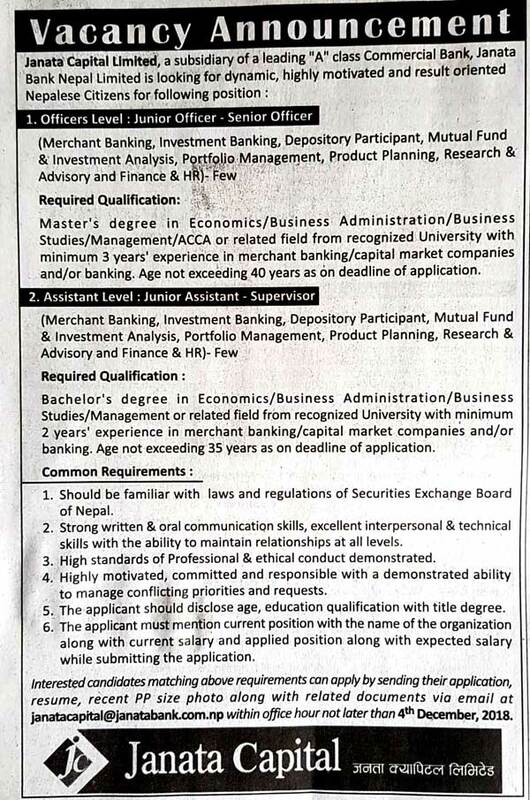 Should be familiar with laws and regulations of Securities Exchange Board of Nepal. 2. Strong written & oral communication skills, excellent interpersonal & technical skills with the ability to maintain relationships at all levels. 3. High standards of Professional & ethical conduct demonstrated. to manage conflicting priorities and requests. 5. The applicant should disclose age, education qualification with title degree. 6. The applicant must mention current position with the name of the organization along with current salary and applied position along with expected salary while submitting the application. Application Deadline : 4th December, 2018. Interested candidates matching above requirements can apply by sending their application, resume, recent PP size photo along with related documents via email at janatacapital@janatabank.com.np within office hour not later than 4th December, 2018.